Yay! We survived the beach! When we hit the beach last summer, Reed was 14 months old so my first tips and tricks report focused on the young toddler. 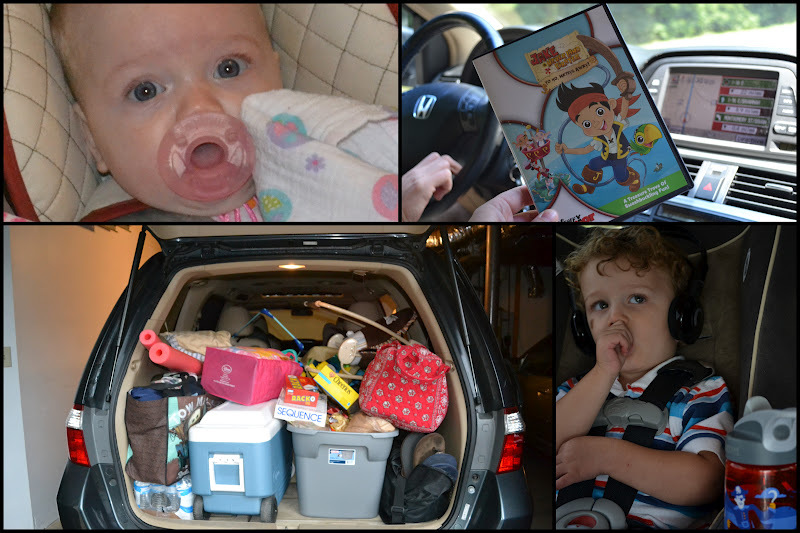 First, though, if you are vacationing with young kids for the first time (or maybe just as a reminder), you should read Mobile Mama's post about vacation priorities. She is totally right. One of the best things you can do to enjoy your family vacation is to set realistic priorities and make them happen. Go ahead and read it. I'll wait. We really enjoyed our time at the beach, but we worked hard and without the right outlook and getting on the same page, we could have been in for some major missed expectations. Last year, all Reed could do was waddle a little bit in the sand, and he was very content to splash in buckets under the safety of the umbrella. 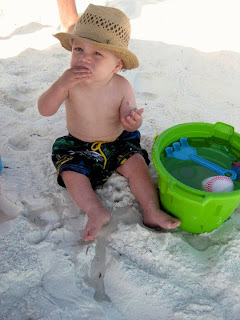 This year, however, he's 100% little boy and was all over the place, so keeping him safe from the sun meant lots of sunscreen prior to heading down to the beach, as well as his uv clothing, a good hat, and his shades. I think the hat and clothing are particularly important because with all of his antics in and out of the water and rolling around in the mud, I don't think his sunscreen stayed on for long. And reapplying would have been interesting. Buckets and shovels. 'nuff said. This was one of our best purchases this year! At the recommendation of several friends we ordered Reed a Puddle Jumper Deluxe. He doesn't really like to play in the water by himself, but the PJ allows him to swim ("float") without any assistance at all. The puddle jumper is actually a life jacket, and I think for little guys it is way more comfortable than a traditional life vest. Snacks were easier this year since Reed can now eat pretty much any foods. But snacks are a must. Everyone knows how much work it is to set up camp at the beach, and who wants to get all settled in just in time to hear, "I'm hungry." Those two words are inevitable. Pack lots of snacks for your busy preschooler! We had peanut butter crackers, goldfish crackers, frozen watermelon, granola bars, and of course cold water. The first day out, Reed loved the beach and entertained himself for the afternoon- digging, splashing, finding, even chasing birds. On our second day, though, he wanted a constant partner in crime. In order to give Matt some relief and since I didn't really want to get in the ocean, I took Reed on a shell hunt. We walked the beach for awhile and he had a big ole time gathering shells. It was really fun. Keep that little cutie out of the sun! I didn't like the idea of using sunscreen on Molly, so I opted to keep her out of the sun all together with four lines of defense. First, a hat (and sometimes sunglasses). 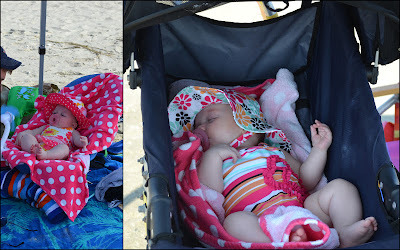 Second, positioning her away from the sun (in the stroller). Third, the stroller canopy. Fourth, a big tent (or umbrella). To me, setting up camp with a substantial source of shade, like a tent or umbrella, is a must! We don't go to the beach often, so we borrowed an awesome canopy tent from a friend. (Unfortunately the wind totaled it, but the upside was that it happened at the end of our very last beach day and we get to buy them a new one instead of having to clean it off. Ha.) If you aren't able to stay out of the sun completely, then definitely use a safe sunscreen, even on a young baby. Three quick options: First, we tried to use the bouncer seat that we brought. It didn't block any wind and Molly was not the happiest camper. Second, I almost bought one of those pop-up baby beach tents from BabiesRUs because I knew we wouldn't have access to a BRU store if we decided we needed a tent once we got to the beach (I think they are about $30). I didn't end up buying one, but everyone I know who has one enjoys them. They block sun, sand, and wind. Maybe a good option to borrow from a friend, or to buy if you frequent the beach. We ended using the jogging stroller mostly. The large tires are great for the sand, the sides and canopy block wind and provide shade, and the handle bar and basket can be used for hanging/holding extra beach gear. A yard sale is a great place to find a jogging stroller for cheap. 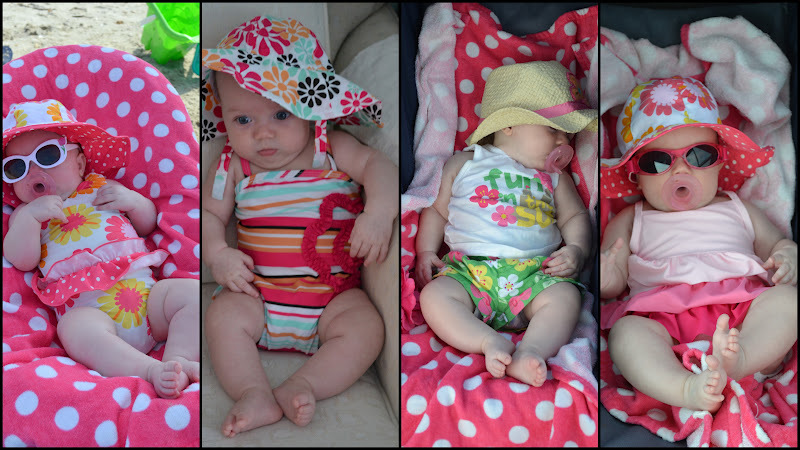 This idea came straight from a beach pro friend, and was definitely one of our best buys for Molly this summer. I've used it a lot the last several weeks to keep her cool during outings. It came in especially handy on our last day when we visited Savannah. I kept it pointed at Molly while she slept through our carriage tour, and clipped it onto her stroller while we walked River Street and ate lunch at City Market. It runs on batteries, and the blades are foam so they are not dangerous. We are so thankful we got a chance to visit the beach this summer! Any additional beach or vacation tips to share?